I have to say we really didn’t really give Kanding a chance, we were only there one night before we moved on to Chengdu. If we had more time it probably would have been worth a day or two. Lonely Planet describes Kanding as a mixture of Tibetan and Han culture. Translation: it’s an example of how the Han Chinese totally wipe out any signs of Tibetan culture, other than a few old people in traditional clothes. Han-ification is a slow but very steady process, and Kanding is a good place to witness older traditional buildings be replaced with charmless malls or recreations of traditional structures. That said the scenery here is very dramatic as you approach from the west. The town is set in a very narrow valley with steep mountains rising on either side, and a very fast moving river in the middle. Once again, Chinese scenery saves the day. There are rumors of there being good hiking around and I wish we had time to investigate these. There are also a number of crazy cliff drawings around the city. 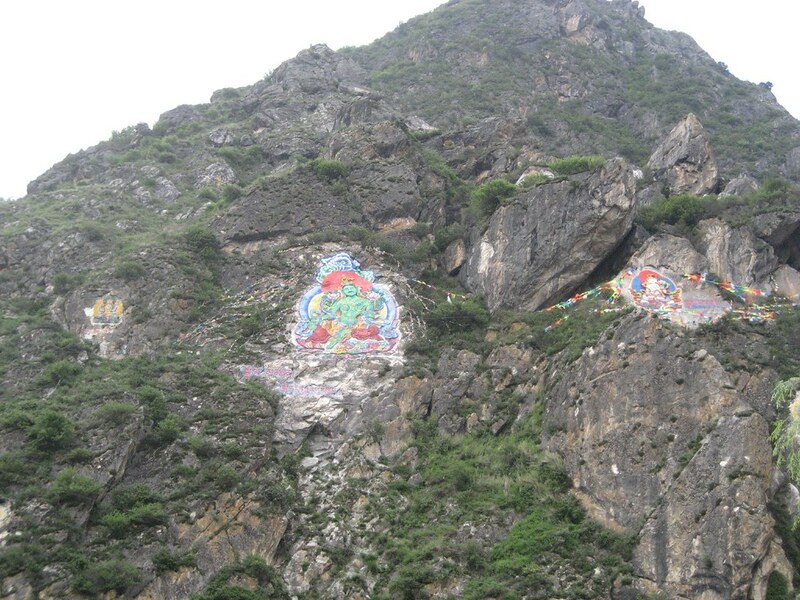 They’re all Buddhist/Pagan figures drawn on shear cliff faces a few hundred feet off the ground. One last thing – On our bus trip into town we passed about 200 military transports taking stuff to stations in Tibet. Han-ification doesn’t happen all by itself you know.